This entry was posted in Latest News on May 31, 2018 by EMP Medic. With yet another hot summer on the horizon it is vital that the public are aware of how to prevent heat related illnesses. Signs of heat exhaustion often begin suddenly with no one being immune when the weather is hot and humid. To tackle the problem read through tips and tricks to prevent heat related illness and how to recognise the symptoms. Remain in an air-conditioned place for as long possible. If your home does not have air conditioning, go to the shopping mall, public library or any accessible place that has air conditioning, just a few hours spent in air conditioning can help your body stay cooler. People often use electric fans to stay cool, but it is important to note that when the temperature is in the 90s and above an electric fan will not prevent heat related illness. Taking a cool shower or bath or moving to an air-conditioned place is a far more effective way to cool off. Another tip is to minimise the amount you use your stove and oven this helps to maintain a cooler temperature in your home. It is important to schedule outdoor activities carefully, arrange activities for when it is cooler, either early in the morning or in the evening – rest in shady areas so that your body has time to recover. It is vital that you pace yourself when outside in the heat, avoid or cut down on exercise. Apply sunscreen is also important. Sunburn affects your body’s ability to cool down and dehydrates you, you can also protect your skin by wearing a wide brimmed hat and sunglasses. It is recommended to avoid hot and heavy meals as this can add heat to your body. Cars can quickly heat up to dangerous temperatures, even with a window cracked open. While anyone left in a parked car is at risk, children are especially at risk to heat related illness. Due to this do not sit or leave anyone in a car that is directly in sunlight. It is essential to drink plenty of fluids regardless of how active you are, do not wait until you are thirsty to drink. Avoid sugary or alcoholic drinks as they cause you to lose more body fluid. Heavy sweating can remove salt and minerals from your body. To stay hydrated you must replace the salt and minerals, this can be done by drinking a sports drink. If you have pets it is important to keep them hydrates. Provide plenty of fresh water in shaded areas. 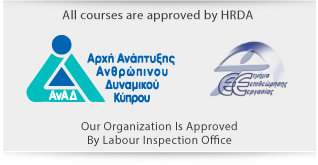 Every month we organise various training courses in different locations all over Cyprus, that we call venues. Does your Organisation have the Required First Aid Kits? According to the law set down by the Inspection Office of Cyprus, every organisation should have a first aid kit with the necessary equipment. The below e-store has prepared a list of the items you may require. Interested in training your staff? 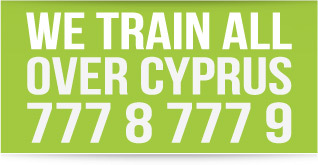 We deliver training courses all over Cyprus, customised to your requirements.